As the temperatures cool, our lawns tend to drop to the bottom of the list of things we need to think about but this time of the year is an important time for lawn care. 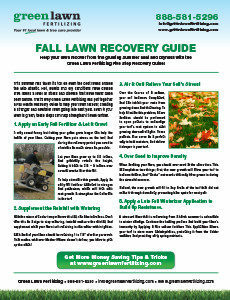 Fertilizing in Fall is crucial to make sure your lawn is properly fed. 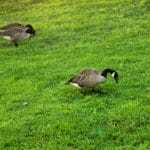 It helps the grass build up energy reserves to survive through the winter and recover from dormancy. 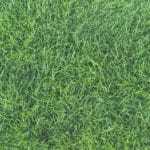 Proper fertilization will ensure that the grass has the nutrients it needs to sustain itself and has the energy to spring back to life when the growing season starts. 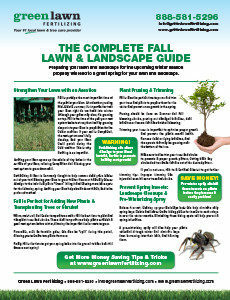 In addition to fertilizing, here are some other tips to get ready for the winter months. Mowing– Mow your lawn gradually shorter until your last cut is down to about 2 ½”. Mowing to this height will make raking easier and minimize matting (matting can make your lawn susceptible to mold and disease). Leaves– Leaves can be mowed over and if fine enough, can be left on the lawn to decompose and add organic matter to the soil. Keep excess leaves off of your lawn though so it can still get the sunlight it needs. Either remove them or break them down enough to provide a fine topdressing while still allowing adequate sunlight. Watering– As long as the grass is still growing and temperatures aren’t freezing, your lawn still needs water. 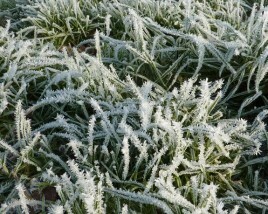 Keep watering 1” per week until either temperatures have reached the freezing point or your grass has stopped growing. 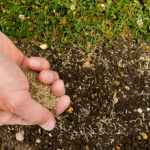 Aeration and seeding– Seeding increases the density of your grass while improving the health and look of the lawn. 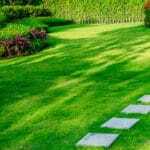 Pay special attention to bare or thin areas because these can easily be taken over by weeds or moss. Aeration relieves compaction, helps to breakdown thatch, and enables the lawn to take in nutrients and oxygen more efficiently. It’s one of the best things you can do to improve the quality of your turf. Tools– Start cleaning and do maintenance on tools and lawn equipment. Debris– Get excess debris off of the lawn ie: sticks and stones, toys, and lawn furniture. Keeping items on the grass may result in brown spots come Spring if left there all winter. Unless they have a permanent spot on the lawn remove them for the winter. These are just a few ways to keep your lawn healthy through the winter and into the spring. Remember, just because it’s not warm out doesn’t mean your lawn doesn’t still need your care! Take advantage of our last fertilizing application of the year today with 30% off!